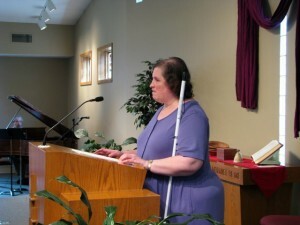 This page focuses on resources for congregations who have persons who are blind and who generally use Braille for reading. See also our page on Vision Resources for persons who have visual impairments but still have partial sight, and for resources on blindness for congregations. 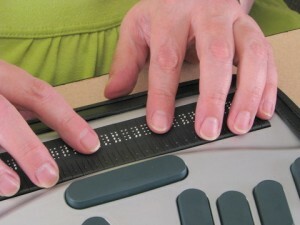 Persons who are blind, especially those who become blind later in life and therefore do not read in Braille often benefit from increased audio services. For personal use, audio books on tapes of CDs are very helpful and fairly readily available. It may be helpful to have Bibles and/or other religious books in the congregation’s library for this kind of personal use. In the worship service, it is important that the leadership be aware of persons who are blind or who have serious visual impairments by not relying solely on the printed word. Announcements can be made orally and important worship material can be made available in Braille. Bartimaeus Alliance of the Blind, Inc. ministers to the needs of blind and deaf-blind individuals for Bible teaching and ministry; to promote Christian growth through Bible centered teaching and fellowship; and to provide study and reference materials centered in the Christian faith. International Christian Braille Mission, Inc. (ICBM) produces and distributes New Testament Christian literature in formats readable by blind and visually impaired individuals. National Association of the Blind in Communities of Faith, a Division of the National Federation of the Blind, offers a mailing list. NFB provides support, information, and resources regarding a wide range of professions, recreational activities, special interests, legislative issues, fundraising projects, and other areas related to blindness. National Library Service For the Blind and Physically Handicapped (NLS) has a national network of cooperating libraries, and administers a free library program of braille and audio materials circulated to eligible borrowers in the United States by postage-free mail. You can find a variety of NLS reference materials on their website here. Optasia Ministry provides biblical study tools and other Christian ministry resources in a digital form that can be read by blind persons using screen reading computer software, giving persons with visual disabilities access to materials that are not usable for them in print form.